They’re like a steak from Applebee’s. They’re like a girl with a man-voice. They’re like a bathroom after someone went “number 2” in it. They’re like used needles. They’re like conversations about Tim Tebow. They’re like the show Toddlers and Tiaras. They’re like a MySpace investment. They’re like the kid who talks about philosophy at a college party. All Average Draft Positions below are based on a 12-team standard league from fantasyfootballcalculator.com. Even if he’s part robot, I don’t see AP producing top-10 back numbers. He’s going to be forced to ease back into the Vikings offense, and if you’re using an early second round pick on him, you’re going to be lucky to be thinking playoffs by the time he’s 100 percent. His reliance on touchdowns in 2012 was scary. Add in the explosiveness of Brandon Lloyd, as well as another year for Aaron Hernandez, and Gronkwoski is bound to have a worse 2012 campaign. Tight end is just too deep for a guy like Gronk. This is clearly due to the holdout. I’m not a fan of drafting players that missed the majority of training camp and the pre-season. MJD fits the bill. His recent injury reminded us of what he does every year. He gets hurt. I like Mathews in the late third round, but someone is bound to get him in the second. I can’t feel good about an aging receiver who’s been on and off of the injury list over the last couple of seasons. He’s on a team that will surely run the ball, and has never had a double-digit touchdown season. Johnson is immensely talented, but I don’t think he’s worth an early third round choice. We’ve all heard the reports that he’s a step slower this season, and that’s scary as a high-end RB2. I’m staying away from Turner because I’m a believer that the Falcons offense is in a transition period. Turner won’t be able to do what he used to. There are way too many talented running backs in San Francisco for me to feel good about drafting Gore in the fourth round. He’s just another reason why going running back early is the smart thing to do in 2012. Rather than give reasons why I don’t like The Law Firm this high, I’ll direct you to my article on him. Aside from the holdout, Mike Wallace was outperformed by Antonio Brown over the second half of the 2011 season. Brown has shown no signs of stopping this pre-season, and is clearly Roethlisberger’s favorite target. I like Brown more than Wallace flat out this season. I’ve been saying it for weeks. Is he the most overrated fantasy player of all time? Probably not, but he’s close to it. Even if Vick was healthy the entire season last year, he would’ve finished as the 7th best quarterback. Do you really want that kind of player, especially when he can’t stay upright? Stay away from Vick. The only time he was worth it was when he was a waiver wire pickup. I like Jeremy Maclin much more in Philadelphia this season. Jackson has averaged 5 touchdowns over the last two seasons, and only reached 1,000 yards in one of them. Last season, he had just two 100-yard games. That’s not what I want in the fifth round. The difference between a tight end outside of Gronkowski and Graham last year was minimal. The position is very deep. Really, the only tight ends you should consider in the middle-rounds are Aaron Hernandez and Antonio Gates. Otherwise, wait on one and get depth at wide receiver and running back. He’s dropping on draft boards, and it’s because he can’t get that hamstring fixed. I’m staying away because round six is still a valuable one. He had two 100-plus rushing games last year, skewing his numbers completely. I think Ryan Williams easily emerges as the guy in Arizona this year, and Beanie will be nothing but a bench player. If you’ve read my 32 in 32 series, you’d see that I wrote about Jonathan Dwyer as a deep sleeper back in the middle of July. Dwyer is the better back given the Steelers’ offensive line issues. Add in Redman’s recent injury, rookie Chris Rainey and a new offense, and you see that there’s a lot of uncertainty with Redman. I’m staying away. I’ve never owned a Panther running back. I know DeAngelo Williams was the best fantasy back a few years ago, but with such a mix in that offense, there’s no reason to reach for one of the two backs in Carolina. Just try and predict what they’re going to do. Each back (Helu, Royster and Hightower) have low ADP’s, but I’m still not going to own any of them because I’d be owning mediocrity. That doesn’t win fantasy championships. Again, the uncertainty and depth of average receivers in that offense is what makes me shy away from Malcom Floyd and Robert Meachem. If I own one, it’ll be Meachem, but I’m probably not going to have either this year. There’s still good talent in the eighth round. A rookie quarterback with a handful of inexperienced wide receivers? I’ll pass. Why should we believe Randy Moss is “back”, especially given Alex Smith is the quarterback and the wide receiver talent there is deep(ish)? People are drafting Moss here because they want the 2007 version of him. The chance of that happening is not only zero, but your spending a 9th round draft choice on it. If Santonio wouldn’t have put up the 8 touchdowns he did last year, we’d be talking about a 40th to 50th ranked wide receiver. Why get involved with the mess in New York? Kevin Smith is the trendy pick right now, and some are willing to reach a little for an inexperienced Mikel Leshoure. Me? I’m staying away from all of them because of unpredictability. If Leshoure falls deep, I’d consider him, but otherwise, I’m just avoiding this running back situation. I do like Matt Ryan. And I’m kind of buying the Peyton Manning stock. 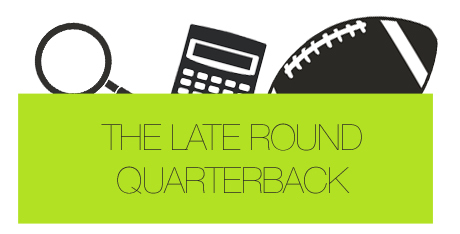 Otherwise, there’s historically been very little difference in middle-round quarterbacks compared to late-round ones. Don’t believe me? Check out this article. Mendenhall won’t play until October, and even when that happens, he’s still more than likely not going to be 100%. And even if he is, you’re banking on neither Redman or Dwyer to get touches after a full September of receiving them. There is way better high-upside players in the 9th round. Why get someone like Mendenhall? Yuck.